2. Fry the urad dal, mustard seeds, green chillies and curry leaves for a minute. 3. Add the onions and saute well. 4. Add the mixed vegetables, salt, turmeric powder and cook for 3 minutes. 5. Add enough water and cook till it starts to boil. 6. Add the varagu arisi and stir well. 7. Stir well and cover with a lid. 8. Cook for 15 minutes or until the water has almost evaporated/absorbed. 10. Add lemon juice and stir to mix. 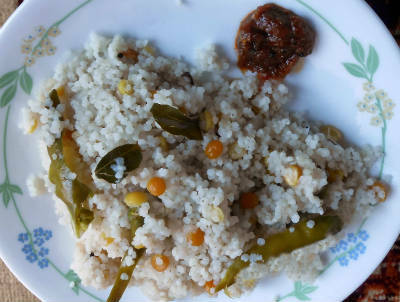 Feel free to comment or share your thoughts on this Varagu Arisi Upma Recipe from Awesome Cuisine.